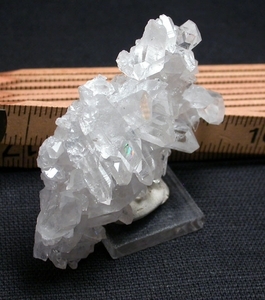 Excellent Arkansas quartz crystal plate cluster features large uncommon 7h faced crystals, rainbows, no matrix at all and no damage. Small cabinet sized, 2-1/16x 3-1/16x 7/8", and a brilliant inclusion to your collection. One crystal has 9 faces, extremely rare; one has a 10-edged broad channel face due to an extra prism face. More than one transmitter, all are quite clear.